Are you a DIY PC builder looking for the best chassis that will keep your gaming system cool? If so, you have come to the right place. After extensive research, we have selected the top 10 best cooling computer cases for gaming based on buyer ratings and reviews. Before delving into the specifics of each model, first it is important to know what factors you should consider in a cooling case for your PC gaming setup. To begin with, the size of your gaming PC body should be compatible with the motherboard you have or plan on buying. Computer manufacturers follow a standard known as form factor in order to size motherboards with the right chassis. ATX is the most common motherboard form factor and it comes in one of three sizes. Micro-ATX motherboards accommodate the least components and are mostly compatible with the compact mini ITX-cases. If you are looking to purchase a mid or full-tower case, then you will need motherboards with the standard ATX or E (Extended) – ATX form factors to provide room for all components. Good airflow is also vital to ensure that your gaming system does not run too hot. A decent PC housing case should come with ample air vents and fan ports for this purpose. Some cases feature pre-installed fans for drawing in cool ambient air and expelling hot air from internal components. If you plan to keep your gaming components super cool, double check the chassis design to ensure it has extra fan ports and enough space for the added cooling fans. Besides the use of fans, other cases feature a radiator liquid cooling system, which can be a great boost if you want to keep internal temperature of your PC gaming components low. Another important aspect to take into account when selecting the perfect chassis for your gamming PC is cable management. Ideally, you want to choose a case that will keep your components organized while at the same time provide ample space to accommodate cables. The space between the motherboard and right case panel should be 1-inch deep or more. Some cases feature rubber grommets, assorted screws, or tie-offs to keep all components in a nice and neat layout. In addition, consider the number and size of drive bays you need. Generally, floppy and hard drive bays tend to be 3.5-inches while those for CD, DVD and Blue Ray drives are 5.25-inches in size. Materials used for a gaming computer’s housing also matter. After all, the computer chassis protects all your expensive and high performance gaming components. Your choice for the body material will fall between plastic and metal, with the latter option providing a more solid and longer lasting build. 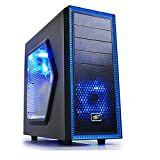 Lastly, but certainly not least, exterior design may also be of importance to some people when it comes to buying a new computer gaming case. If you care for aesthetics, then choose PC panels that have a flashy and stylish look. For example, some designs feature LED lights, smooth curves, attractive colors or side viewing windows for a classy finish. Now that you know what to look for in a gaming computer case, let’s dive into some of the best models on the market. We have included a wide array of choices to suite different budges and gaming needs. So, without further ado, here are the top 10 best cooling computer cases for gaming. 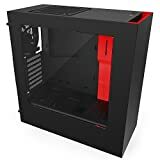 If you are looking for a budget friendly and well-built mini-tower case, then look no further than this Rosewill MicroATX chassis. Its features a robust SECC steel panel finished with blue LEDs for that elegant appeal. As the name implies, this case comes with two fans at the back and front. You can fit a MicroATX motherboard with a standard VGA card, ATX PS2 power supply inside and remain with 4 expansion slots. The case also offers two 5.25” and three 3.5” drive bays. In addition, the front panel has ports for easy connection of headphones and USB devices. The Rosewill SRM-01 has most of the features you will find in its big brother, the dual fan RANGER-M. This includes dual 2.0 USB ports on the top panel, jack ports for your mic or earphones, and compatibility with micro ATX motherboards having a PS2 power supply. However, this case is rather plain in design and it only has one pre-installed 80mm rear fan. You have the choice to add another 140mm front cooling fan. The only addition in this mini-tower case is one 3.0 USB port on the side. With the Versa H15 Thermaltake gaming computer case, you can build a super cool mini-tower gaming PC. Along with one pre-installed 120mm rear turbo fan, this gaming PC housing can accommodate two extra fans of similar size. You can even add a 240mm radiator cooling system to boot. What’s more, the perforated mesh bezel allows for extra breathability. Just above the two LEDs at the front, you will find two sockets for headphone/mic jacks as well as one 3.0 and 2.0 USB ports each. Perfect for Micro ATX Intel and AMD motherboards, this case offers only 3 drive bays and expansion slots for long graphic cards. If having plenty of mounting options for cooling fans is a priority, the Corsair Carbide Series 100R gaming computer case is the way to go. This mid-tower PC chassis takes up to five cooling fans. One 120mm fan comes already pre-installed. Additionally, the tool-less interior and cable routing channels provide beginners with an easy DIY PC building experience. You can build a high powered mid tower gaming PC with the Corsair Carbide 100R case thanks to its two 3.0 USB sockets and multiple drive trays with support for Solid State Drives (SSDs). Included in the package also is a side mounted window that lets you admire your gaming PC’s internal components. As with the Corsair Carbide 100R gaming PC case, tools are not required to access internal components in the 200R ATX case from the same series. This case also has two 3.0 USB ports, power & reset buttons and audio in/mic out jack ports placed conveniently on top part of front panel. For an even superior cooling system, the Corsair Carbide Series 200R mounts up to 8 fans. The body has great ventilation, thanks to meshed panels. Inside, you will find seven expansion slots and trays for 5.25” drives. You can customize the case with Corsair compatible liquid coolers like the H80i, H75, H60 or H55. Best of all, the internal layout stays nice and neat due to cutouts for cabling and CPU cooling. Compatible with ATX, micro-ATX, and mini-ITX motherboards, the NZXT CA-S340W-W1 computer case offers great versatility when it comes to form factor. The back panel has slots for up to 7 PCI-E add-on cards. With three 3.5” and two 2.5” drive bays, you can build a PC gaming system with massive storage using this case. Despite the steel/plastic construction, 90% of the chassis is metal. 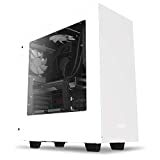 The NZXT CA-S340W-W1 features a white color finish, but this series offers up to 9 color choices for the exterior each with a side-viewing window. You can add only 4 fans inside but this housing for gaming PCs is also compatible with Kraken series liquid coolers. Its I/O panel offers an audio/mic port and two 3.0 USB connectors. Similar in design to the previous PC gaming chassis, this model offers a robust build quality forged from ABS plastic and SECC steel. Both of these gaming PC cases have the same number of port sockets, bay drives and expansion slots. Only major difference is the color finish, whereby the NZXT CA-S340MB-GR spots an attractive matte black/red exterior. This is another great case if you want to build your gaming PC with intake and exhaust fans. The Zalman Z3 Plus-W comes equipped with 5 pre-installed 120mm fans right off the bat. You may opt to ad compatible 240mm dual radiator AIO liquid coolers on the top and front sections inside the chassis. Straps make it very easy to manage interior cables. There are plenty of vents along with dust filters to keep internal components cool and clean. You can fit a standard ATX or micro ATX motherboard inside this case along with graphic cards that are up to 420mm in length. Up to six bays for 2.5-inch, 3.5-inch and 5.25-inch drives allow you to customize your system with an array of storage devices. Once done building the gaming PC, a transparent side window lets you see your amazing hardware configuration. Designed to house mini-ITX, mini-ATX, microATX and standard ATX motherboards, the DeepCool TESSERACT SW gaming computer case has an impressive form factor profile. Its exterior is made of SPCC, plastic and rubber coating. Front and back panels have meshed design for increased airflow in and out of the case. The blue LED lit fans mounted on the front and side panel add a fancy feel to this case’s design. For easy peripheral connection, users get at least one port each for USB 3.0 & 2.0 as well as audio/mic jacks on the top panel at the front. Drives bays are five in total. These include two external 5.25” and three internal 2.5” drive bays. The Corsair Carbide Series SPEC-02 Mid Tower Gaming Case takes internal cooling to a whole new level with its ability to house up to six fans at the front, back, rear top and bottom sections. Within the case, you will find seven PCI-E ports, capable of taking graphics cards of up to 426mm in length. You can install two 2.5” and three 3.5” drives all the same time inside this mid-tower gaming case. Everything will be easy to organize thanks to proper cable routing and you can view the interior via a large side panel window. Complementing the sleek black exterior, red LED fans give the Carbide Series SPEC-02 Mid Tower Gaming Case a stylish appearance. Choosing a chassis for your gaming PC is a monumental decision, which should be given the seriousness it deserves. Think about it; the selected case will affect plenty of factors regarding the type of gaming computer you end up building. For starters, the frame determines what components fit inside it. It also affects efficiency of the cooling system, ease of building your gaming computer, and how the system will fit into the space you have. Any mistakes made in your final choice can therefore create a whole host of problems. For instance, you would not want to purchase a micro-ATX case only to find out that it is too small to accommodate the number of components that make up your mini-tower gaming PC. In the same vein, buying an extended ATX chassis when you don’t have components for a full-tower PC system could be a waste of space, especially when trying to use it on a small desk. What’s more, moving such a large gaming PC would be quite the chore because full-tower cases are rather bulky. You also don’t want to choose the wrong internal design for your gaming PC’s components as this would mean cables won’t hide easily or the case won’t close up completely. Overheating could be a problem as well if the gaming PC cooling case you choose does not provide enough fans to maintain good airflow in your gaming system. And, the downside with a system that runs to hot is that this will eventually cause premature damage to your precious PC components. Luckily, all of these pitfalls are avoidable if you take into account the tips shared at the beginning of this post. Ensure to do so when comparing the aforementioned gaming PC cases rather than blindly looking for models that have the most appealing feature set. Because let’s face it; the best chassis for a gaming computer must not necessarily have the most impressive features. You have to decide what matters most to you in a gaming PC’s case. 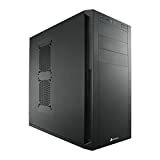 Is it form over function, ease of building, slots for multiple graphics cards, price, durability, expandability, or something else? Make sure to be very clear about your gaming needs. This increases the chance of selecting a PC body that is perfect for your gaming system.